An easy-to-apply instant tan which easily washes off for an olive complexion or if you want a darker tan. 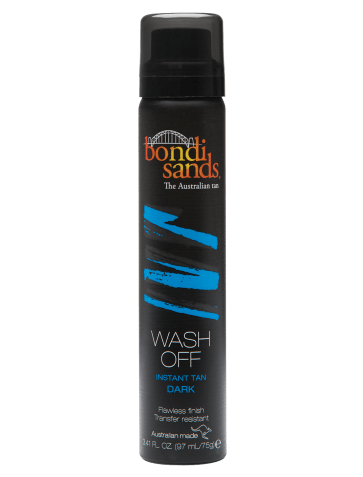 To top up your tan or for extra colour, Bondi Sands Wash Off Dark has you covered. Perfect for when you forgot to tan the night before. 1. Use Bondi Sands exfoliation mitt to ensure your skin is clean and free from any moisturisers. 2. Shake the can well before spraying a light amount of Bondi Sands Wash Off onto your skin. Be sure to hold the can approximately 15cm away from the skin. 3. Use your application mitt to spread evenly over skin. Allow 60 seconds to dry before dressing. To wash off use a cloth with warm water and soap.